Crisp noises and subtle textures characterize the moody music created by Mathieu Serruys, inspired by film and irrational fear. Using mostly reel-to- reel tapes, he evokes intimate, comforting atmospheres, yet disturbing at the same time. 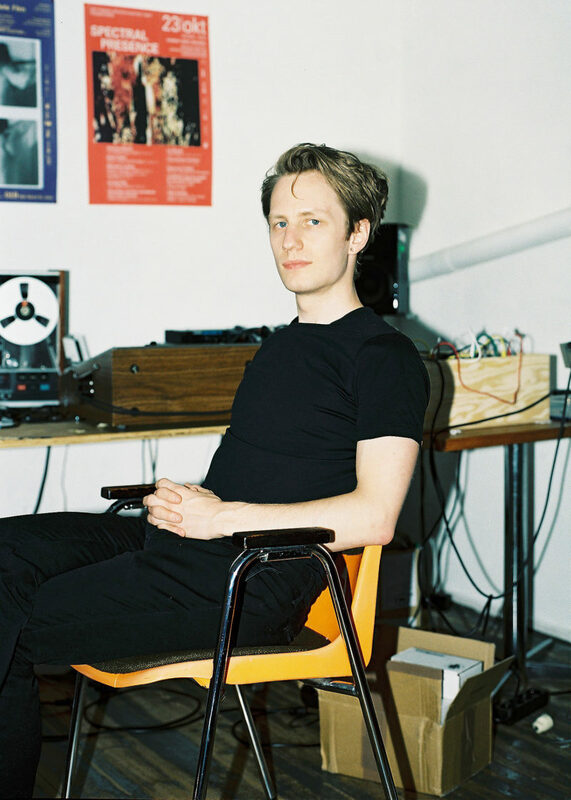 While his debut, On Germaine Dulac (2014), was well-received, Serruys strives tokeep pushing the boundaries of his experimental music for future compositions and live-shows. For Serruys, it is clearly important to keep experimenting with new ideas and frameworks. He does not want to stay too comfortable. This is why the element of improvisation is a crucial aspect of his shows. Chance is of course intrinsically part of the tape recorders he uses. He is not always in control of what the tapes will do. Sometimes unexpected sounds are created, at other times a sound he was aiming for simply does not come out. On Germaine Dulac is derived from a soundtrack Serruys made for a screening of Dulac’s La Coquille et le Clergyman (1928), organized by Cinema OFFoff. Having this film with particular atmospheres and moods as a starting point was a great way for Serruys to compose music. “Film is the only medium that gives me a large feeling of involvement. A crucial aspect of film to me is its scenic quality or ability to evoke landscapes. There Will be Blood, for example, is a film that I often rewatch, because it is clearly made by someone with a love for striking images or landscapes. The music Serruys originally composed for the screening of La Coquille et le Clergyman is based on the film itself, but he wanted the album to be more than just a soundtrack. “I needed to create an album that stood on its own, so I reworked the music that I originally composed for the screening. It was Joris Verdoodt who asked Serruys to compose the soundtrack for La Coquille et le Clergyman. Verdoodt also played an important role in the development of the music for the eventual album. Serruys and Verdoodt have a clear vision for the music they bring out on the label. They invite artists to compose music from an extramusical framework that they provide. In addition, their graphic work is always motivated from the content they work with, and is not merely based on aesthetic choices. They like playing with opposing elements with ambiguous meanings. Serruys’ music is also characterized by juxtapositions. A sense of comfort contrasts with the sense of an underlying threat. Serruys also tries to challenge himself by switching up the machines he plays with. He used to only generate sounds from tapes, simply using effects from the tape recorder itself, such as overlay and delay.